One of the things I love about doing preschool pictures (A Little Glamour Photography) is that I meet all the wonderful families of the kiddos I shoot, and sometimes they hire me to do their family pictures! 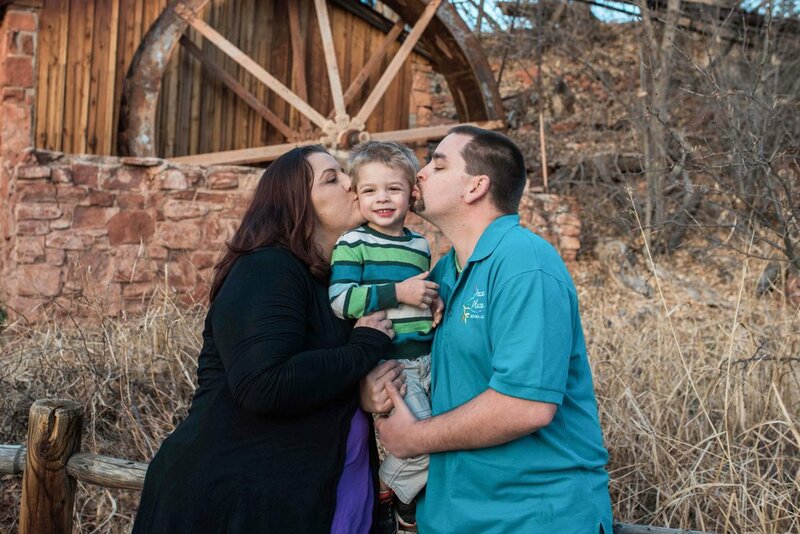 Now, when Tonya asked if I would do their family pictures up in Sedona at Red Rock park, I jumped at the chance! One, it's Sedona, how could I say no? Two, Mr. Mason has been a complete ham every time I've "shot" him, and nothing brings a smile to my face quicker than a cooperative kiddo. Three, I love shooting at new locations, and even though I've been to Sedona more than a handful of times, discovering a new spot was great! Four,...did I mention Sedona? and THEN the camera came out. Mr. Mason was such a trooper; even though he wasn't feeling well, he'd smile every time I asked...or went after his "tickle toes." Speaking of toes, ours were pretty numb after getting to our location. The red rock slab where a lot of these were shot was in the middle of Oak Creek, and after the recent snow melt we had to cross a log, and then kick off our shoes to wade through it. It was totally worth it though. I will never get sick of the orange/red/purple colors of Sedona's rock formations. Tonya, thank you so much for letting me capture you and your family, and I hope you guys had as much fun as I did!